In a summer when investors have been caught off guard by everything from emerging market woes and the dollar’s tailwind to a brewing trade war, commodity markets have once again appeared in the crosshairs in terms of market turbulence. This time, it is not China, OPEC or oil which are central to crisis, but rather it is the USD-financed emerging markets and their mined metal and soft commodity production. We do not think the emerging markets crisis will be a China crisis and we believe that copper and zinc are set to rebound. Three major President Trump-related developments are having a significant impact on the commodity universe right now. First, the US decision to leave the Iran agreement and impose sanctions in two stages against Tehran laid the ground for a more direct market pricing of any similar actions against other countries. Second, sanctions were imposed on Russia, and and most recently, US import tariffs on steel and aluminium were doubled on Turkey. Third, on top of sanctions, developments in the trade war stalled during the summer and the positions of the various sides appeared to become locked. 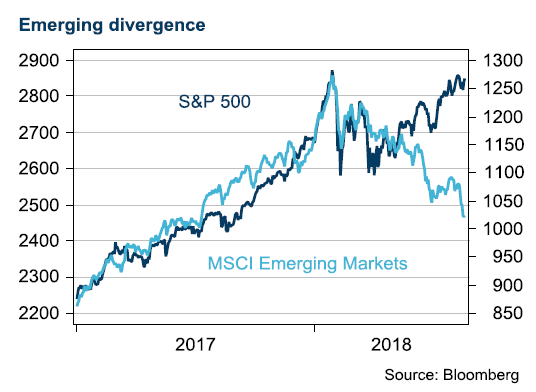 These developments served to illustrate the US approach to emerging markets, in our view, and changed market pricing, kicking off a divergence between the pricing of US assets and those of emerging markets. 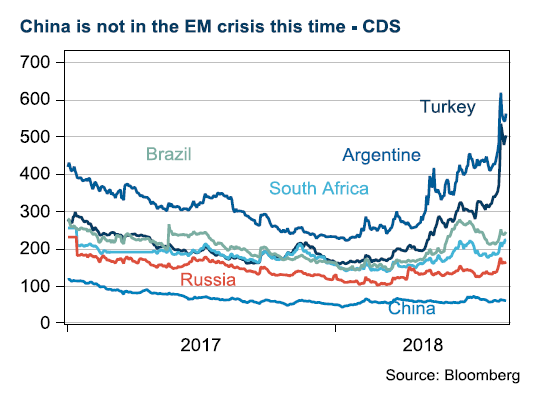 If the Turkish currency crisis is not staved off, the risk of a financial system meltdown and, ultimately, a government debt default is high. But even though Spanish banks are vulnerable, Turkey’s problems should not hurt the overall eurozone economy to a significant degree. Euro weakness and European stock market declines due to the escalation of Turkey’s crisis therefore seem to be overdone. However, Turkey is far from out of the woods yet and the situation might need to worsen still to convince Turkey to adopt a painful, but more sustainable, path toward regaining financial markets’ trust. 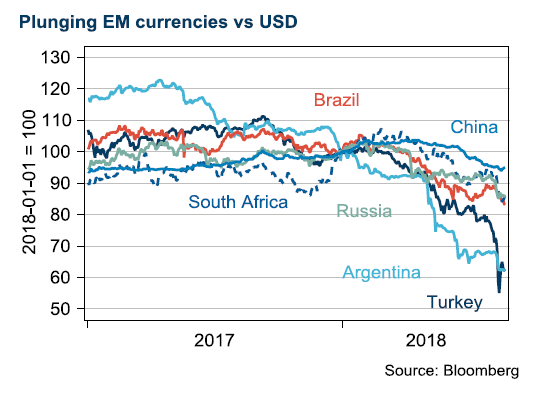 Other emerging markets with similar challenges, such as South Africa, Argentina and Pakistan, also face tough times ahead. What ties the affected emerging market countries together this time is expensive USD financing. China is not among them. 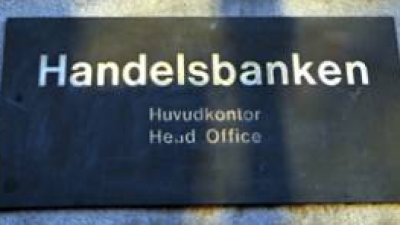 This is can be seen clearly by studying developments in the cost of credit default swaps, or CDS. China has barely moved while Turkey and Argentina have gone through the roof. Among the worst hit are Brazil, South Africa and Russia. These countries have also seen their currencies underperform along with their local equity markets. As currencies have fallen, investors have started to anticipate an increase in the export of commodities to secure income. We have seen agricultural commodities trading lower, as seasonal stockpiles are expected to be shipped at a higher rate than normal. The idea that fear is stronger than greed is relevant here, in our view. We think the first phase of President Trump’s threatening of the emerging markets is over. Running the numbers on the impact of tariffs still points to a bright future. It is hard to prove that tariffs will take a meaningful toll on growth in consumption, we believe. The impact on corporate investment is more difficult to judge. Typically, there are many negative assumptions made ahead of investments decisions. After President Trump’s “flip flop” policies, there is scope for many more multinational companies. Our base case is that President Trump will sign a deal with China in November, in time to influence the midterm elections. In such a scenario, we think base metals would recover, especially copper. Within base metals, it is clear that those more exposed to the Asian construction sector, e.g. copper and zinc, have been the greatest losers, while nickel has done much better, supported by a larger share of demand coming from the US and Europe, posting positive data during the summer. The first phase of the new US sanctions against Iran came into force in August. Among other things, this means that Iran cannot use USD. However, sanctions on oil exports will not come into effect until November. These sanctions will probably not hit the country as hard as the previous ones, as they do not have the support of the rest of the world. Oil prices rose after, among other things, the French oil company Total announced at the OPEC meeting in June that it had already stopped buying oil from Iran. This decision was a typical action in line with American sanctions, whereby a company safeguards its activities in the US and prioritises trade with the US as the larger market. President Trump also always has the option of taking sanctions against Iran to the next level. As with the last occasion that the US used sanctions against Iran, the country could forbid all companies that trade with Iran from having access to the huge US market, and prevent dollar funding. This makes the US sanctions very effective. In the first half of the year, leaders from the EU tried to get the US to remain in the Iran agreement and presented a series of measures to instead put pressure on Iran, including closing down the missile programme. The Trump administration considered the measures to be insufficient, and chose to withdraw from the agreement. Now, the administration has urged Iran to return to the negotiating table to formulate a more comprehensive agreement than the previous one; however, Iran has stated that the US must first revert to the agreement before negotiations can recommence. In our view, the current sanctions are fully accounted for in the oil price and a certain amount of ‘over-compliance’, such as in the example of Total, is also priced in. However, what has not been included in the oil price, in our view, is the reality of President Trump taking a step further and cutting off Iran from the global economy completely. In that case, for example, China would not be able to import oil from Iran. 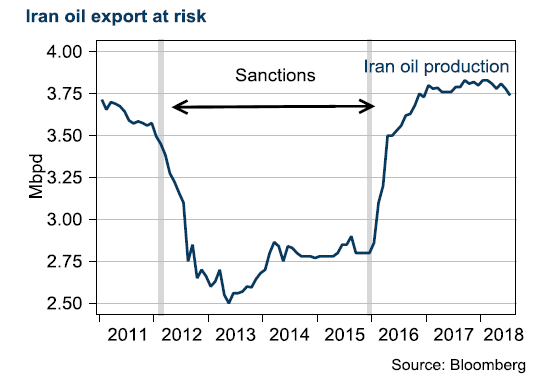 The latest decrease in the oil price (from around USD 78/barrel in early July to USD 72) can mainly be attributed to the escalating trade war between the US and China, in our view, but this does not mean that the situation with Iran has become any less significant. Power markets have surged during the summer as because of weak hydro supply and high temperatures (Nordic reservoirs now 18% below seasonal norm). 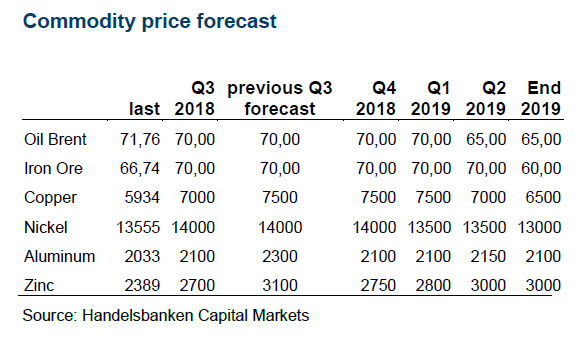 Prices also supported by strong fuels complex and Emission Rights hitting a 7-year high EUR 19.33 at the time of this being published.